This post is a tongue-in-cheek response to the Handbook of Nature Study's post yesterday entitled "February Wildflowers 2015". There is a relatively new company called Heirloom Audio Productions that makes audio drama productions of the historical fiction novels by G.A. Henty. Last fall I was blessed to be given the opportunity to review their first audio drama, Under Drake's Flag. Their second audio drama, In Freedom's Cause, is now available, and I was so happy to again be selected for the review. 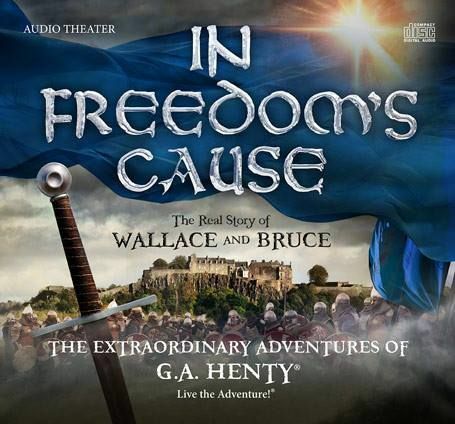 For purposes of the review, the Review Crew received In Freedom's Cause (CD Set - Physical Copy), In Freedom's Cause Study Guide (Digital Download), In Freedom's Cause Soundtrack (MP3 download), and Printable copy of The Prayer Of William Wallace. (Digital Download). The short review: my son liked it! The long review: keep reading! This incredible video shows why squirrels seem to fly -- why they need to! The Ambleside Online selection for Folk Song for February 2015 is The Keeper. I just loved this! Wish more than one of my kids had pursued music!